I don't know much about this cultivar from its name must come from Vero Beach.. I saw reference to this is a USDA paper and it made reference to it indicating it was an early flowering B type. 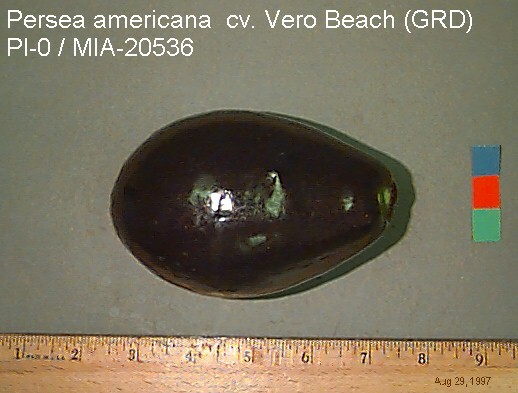 It was collected by the USDA in 1968. I did not see fruit on the tree abut from the picture looks like a shiny black skin Mexican type. Reported fruit size is 9 oz. Looks a but like a large Mexicola. My interest is as a pollinator for early A flower varieties. I have it sharing space with another variety with similar characteristics, the Cellon's Hawaii. Both growing on the same tree. I would probably keep this for a couple of years pending evaluation of its flowering habits. I have top worked both trees in December 2013 and are growing nicely. February 21, 2015: The tree is growing well. sharing with Cellon. It started to bloom in the last few days. In a week or so I have to remember to check flower type. September 19, 2015: This tree only has one fruit and is actually large and clean per today's picture. I'm not sure when to pick because according to the USDA this is a dark skin and not is showing no indication. I'm wondering if the fruit is actually this tree. The fruit in today's picture is at least 25 oz.